An open-top bus tour marking Luton Town's promotion to League One has taken place. The Hatters were promoted after a 1-1 draw with Carlisle United, but they cannot catch Accrington Stanley at the top of the league. 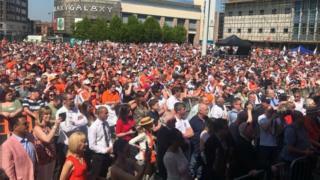 Luton Town chief executive Gary Sweet said the event was "a great opportunity for the whole town to enjoy the promotion party". The event began at midday at the club's Kenilworth Road ground. The bus went along Dunstable Road, Telford Way and Manchester Street to St George's Square, where a number of short celebratory speeches took place. Players and officials attended a civic reception in the Town Hall. Live music played on stage as large screens displayed this season's highlights. Mr Sweet said the event "underlines the great relationship we have with the town". Mill Street, New Bedford Road, Bridge Street, Inkerman Street, Wellington Street, Dunstable Place and Oak Road were closed while the event took place. Promotion ends a 10-year spell outside the top three tiers for Luton, but it did not stop manager Nathan Jones insisting his side had been the best in League Two.